Another month, yet another record low for Arctic sea ice extent in a warming world. January’s average ice extent in the Arctic was 525,000 square miles below the 1981-to-2010 average, making it the lowest January extent in the satellite record. This is an astonishingly large loss of ice — equivalent to 80 percent of Alaska. But what happened in January was equally, if not more significant, for its timing. It happened when the Arctic was gripped by frigid, polar weather. Record lows in the Arctic once occurred mostly in September — at the end of summer when relatively warm temperatures naturally cause the frozen lid of sea ice to shrink to an annual minimum extent. With human-caused warming added on top of relatively mild summer temperatures, record melt-backs in summer perhaps are not so surprising. But now, dramatic reductions in sea ice are occurring more and more often during the cold season. Why should those of us who don’t live in the Arctic care about what’s happening up there? I don’t know about “immediate,” but there are myriad ways that changes in the Arctic are affecting the rest of the world — for example, changes to fisheries as fish stocks move north, and possible (but still unproven) effects on weather far to the south. Shriveling sea ice also has turned the region into something of a new frontier. Many nations are eyeing the Arctic’s opening sea routes, its strategic position between Eurasia and North America, and its potentially huge reserves of oil and gas, as well as other resources. This, in turn, is having geopolitical consequences. Among them: Russian military moves that some analysts believe are designed to bring down an “ice curtain” in the region — intended to deny other nations access to large swaths of the Arctic. As sea ice growth last month was lagging far behind normal and heading for its record low, politicians and scientists attending the Arctic Frontiers conference were discussing the ramifications of the new Arctic. Among the scientists was Ingrid H. Onarheim, a researcher at the University of Bergen and Bjerknes Centre for Climate Research. She began an overview talk about Arctic sea ice by putting the trend into a long-term context: “The recent sea ice loss is unprecedented,” she said, at least during the last 160 or so years. Modern satellite monitoring of sea ice could not by itself reveal that insight, because it dates back only to 1979. So for a longer term perspective, researchers from NSIDC and elsewhere turned to novel data sources. These included whaling ship logs, sea ice charts from the Danish Meteorological Institute, compilations by U.S. Navy oceanographers, observations from aircraft, and other sources. All of this disparate information had to be digitized and then synthesized to be compatible with one another. The resulting database, going all the way back to 1850, shows that at least since then “we’ve never had as little ice as we have now,” Onarheim told her colleagues at Arctic Frontiers. Before getting into what these maps show, I should point out that there is a typo in the one on the left. It should be 1850-1900. With that correction in mind, let’s turn to the details. 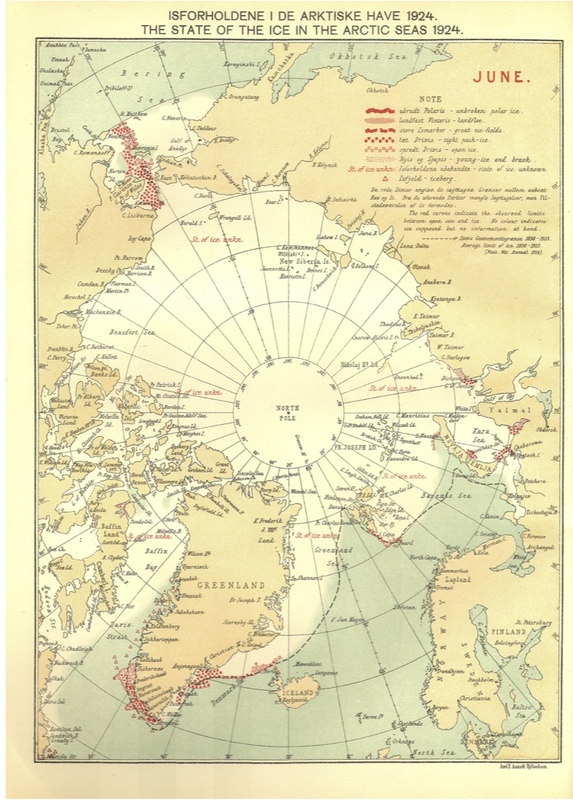 The left-hand map above shows the concentration of sea ice during September of 1854. The new database shows that this month had the smallest ice extent during the entire 1850-1900 period. The other maps in the triptych show what sea ice looked like for the lowest September in each of those respective periods. It is apparent that the recent September minimum of 2012 is far less than the minima of the two earlier . . . periods. This comparison indicates that the summer ice minima of the past decade have no precedents in earlier decades back to 1850. The first thing that jumps out at me is the dominance of blue, meaning lower than average sea ice, starting around 1975. It’s most pronounced during July, August and September, the warm months. But recently, deeper blues have been spreading out into the cold season months of November through April. There is no doubt as to what’s behind the accelerating decline of the sea ice at the top of the world: warming from humankind’s emissions of carbon dioxide and other greenhouse gases. There is also no doubt that the Arctic is actually ground zero for climate change — it’s warming twice as fast as the globe as a whole. But the Arctic is a very big place, and the regional patterns are just as important as the overall trend. No region has been affected more than the Barents Sea, located north of Norway and Russia, and the nearby waters just north of the archipelago of Svalbard. And as it turns out, the strongest effect in this part of the Arctic has been — you guessed it — during winter, according to Onarheim. The Gulf Stream, carrying warm Atlantic water, moves north along the Norwegian coast and divides into two main branches, one on either side side of the island archipelago of Svalbard. In the Arctic Ocean, this Atlantic water becomes denser as it cools and therefore sinks. After circulating, the now cold water leaves the Arctic Ocean, mainly through the Fram Strait between Svalbard and Greenland. (Illustration: Audun Igesund, Norwegian Polar Institute). Scientists have known for 100 years that warm Atlantic water rides north on the back of the Gulf Stream, and that extensions of that massive current take it all the way up into the Barents Sea and over the top of Svalbard. (See the map above.) Research has shown that increasingly warm Atlantic Ocean water carried on these currents — about 1 degree C warming since 1979 — is inhibiting sea ice from forming, even as winter air temperatures continue to plunge well below freezing. Research by Onarheim and her colleagues shows that warming Atlantic waters arriving north of Svalbard on the currents are having several specific impacts. To start with, they push under the sea ice that does form, inhibiting further growth and even causing it to melt from underneath. This leaves the ice thinner and less extensive than it otherwise would be. With less floating ice forming a cap on the sea during winter, the relatively warm sea water is able to give up more heat to the atmosphere. And that helps explain a nearly 7 degree C increase in mean air temperature north of Svalbard in winter, according to Onarheim’s research. As air temperatures naturally warm in the spring, the thinner ice can melt out faster. That leaves the water exposed to sunlight for longer periods. So it absorbs more energy and heats up — inhibiting the formation of ice when cold air temperatures return with a vengeance in the fall. And that means still less sea ice in the winter months. The oceans make up 70 percent of our planet’s surface. And water is particularly adept at soaking up heat. So much so, in fact, that Earth’s oceans have absorbed more than 90 percent of the heat that has accumulated in the planet’s climate system due to our emissions of greenhouse gases. As we’ve now seen, some of that heat has a tendency to come out — nowhere more readily than in the Arctic, where the frigid atmosphere is practically begging to absorb heat, and where the Gulf Stream’s northernmost extensions have been only too happy to oblige. In other words, the models are saying that in just a little more than forty years, Arctic waters could be ice free year ’round. That would give us a radically new Arctic — and a very different planet than the one we live on today. One last thing: So far, Arctic sea ice has been disappearing more quickly than the models have predicted. So we may not have to wait four decades for completely ice-free Arctic waters. So they moved their latest “predictions” for an “ice free Arctic” predictions now to 2061/2088 instead of “next summer” (NSIDC, 2009) and “2016” (Al Gore). That at least gives us some comfort (if they are right this time along with the fact that World Agricultural Production is setting new records yearly, and some high level influential folks are saying that the little warming (currently 0.26 degrees over NOAA’s etire satellite record, may be actually beneficial to personkind. What “high level influential folks?” Scientists? I’d appreciate some names to back up that claim. You won’t find any references to them in your favorite quoted links, Washington Post, and obscure Florida Newspapers, but a little research on Google might open your eyes to the other side of the debate! To get you started, you may have heard of your own government Administrator of the Environmental Protection Agency? Or maybe have a you passing aquaintance with Mother Nature who has bestowed all her bountiful gifts on humanity during the warmer periods on this Earth. She continues to do so as we continue to set World Records for Agricultural Food Production every year, as the Earth warms slightly. You’d need to check out a little social and anthroplogical history here though, and it may be a tough grind for you! Nevertheless being well informed requires a little work, looking at all sides of the issues, not just letting the Washington Post tell you what to think! There are two sources, to get you started, and they don’t get more high level or influential than that! Have fun, and let us know what you find, ok? We were talking “influential” as in policy making, right, Mikey? Since he and Trump took over, the Global Warming Hysteria Hoax is having a “Me too” moment! Starting with the above article: Ice Free Arctic is now postponed for another 50 years (no you can’t have your monry back! “”They just reported that Tuvalu, the poster child for inundated island groups is actually growing. They have pictures to prove it! The news from the Denmark is that the two poster children glaciers, Petermann and Jacobshavn in Greenland are growing again. They have pictures to prove it! NASA reports that sea levels have not risen in the last two years. There’s a chart to prove it! They just reported that the Arctic ice will not be gone anytime soon. At least, they are guessing, not for another 50 years, or so! Bloomberg is reporting today, that that scientists have just “ruled out” the worst case scenarios of Global Warming! A study by the University of California San Diego has claimed that by 2050, the Sun is expected to become cool. You might think “what’s the big deal,” but remember that this means the solar activities that create the heat of the Sun to sustain life on Earth may diminish. And the last time it happened was in the 17th Century, when the Thames River froze. Scientists call this the “Maunder Minimum”. Physicist Dan Lubin at the university and his team studied the past event and concluded that were are in for a worse case. The Sun is expected to get much dimmer than last time and, in scientific terms, it is a “grand minimum” — a time period in the 11-year solar cycle when the solar activities are at the lowest point. You really equate NASA charts, Google Earth Engine History satellite photos with Bigfoot dress ups? Or maybe it’s your “Russians” again? I will remind you that it is Global Warmers that show stock photos of sick Polar Bears, and photo shopped pictures of New York under 30 feet of water. This is too much drivel, even to laugh at! Mark it up to another “win” for you! You’re the one that seems fixated on Russians here. They must have joined the militant compatriots as the bane of your existence. Why do you refer to me, an old retired Canadian as “comrade”, again? Your statement that my remark about “comrades” compares you to Russians is flat out false. In the other thread in which this comment was made, you stated that appeals to authority and ad hominem attacks were more at home in religion, today’s college campuses, or North Korea — pay attention –North Korea, not Russia. I then provided easily found examples of you engaging in both an ad hominem attack and an appeal to authority argument, then said, “Preach on brother, or is it comrade?”. It was an obvious allusion to religion and North Korean communists, for all but the most obtuse. The full context of your initial “militant compatriots” remark in another thread was that you made the rather astounding claim that “your more militant compatriots” had hacked your account. You of course provided no proof that the alleged cyber attack was politically motivated, leaving your claim to sound like the paranoid delusion it almost certainly is. There’s proper context for you, and it really didn’t help your credibility to go off topic on it here. What a tortured, rambling, dissembling response.! You totally ignored the on topic discussion above! Needs no further comment from me! You are a very needy, insecure person, Mikey. Perhaps your self congratulatory, self aggrandizing narcissim will help keep you off the streets. But if you are going to sum up a scientific discussion, and put it in context, you need a modicum of reference to the actual subject being discussed. Your contorted back slapping of you and yourself aside, that is a major omission! Oh, I’m quite well. You, on the other hand, are clearly projecting in an effort to distract from just how deluded your hyper partisan views have made you. And unfortunately, I don’t think the prognosis for your recovery is very good at this point. That was for summer ice. One would expect record crop yields with improving agricultural practices and improved automation. I agree, it’s actually happening!, but that viewpoint has me labeled a “climate change denier”! Are you able to identify the reason for the record crop yields. Did you investigate whether the crops included new varieties, new fertilisers, changes in season cycles to increase yield, different crop management and harvesting techniques, different weather patterns, or have you just attributed all that crop yield to increase CO2? This increase in plant food, Co2, has helped too! It is clear you cannot answer the question asked. The greening of the planet does not of necessity lead to an increase in crop yield and may well not drive current crop yield. You demonstrate a clear fallacy of logic by attempting to attribute increases in crop yield to CO2 driven greening. Firstly, the picture is complex and changes, crop by crop, agricultural region by agricultural region, nation by nation. To give you some idea, as you seem unaware of the complexity of this issue, here is what the EPA says on this issue. “Higher CO2 levels can affect crop yields. Some laboratory experiments suggest that elevated CO2 levels can increase plant growth. However, other factors, such as changing temperatures, ozone, and water and nutrient constraints, may counteract these potential increases in yield. For example, if temperature exceeds a crop’s optimal level, if sufficient water and nutrients are not available, yield increases may be reduced or reversed. Elevated CO2 has been associated with reduced protein and nitrogen content in alfalfa and soybean plants, resulting in a loss of quality. Reduced grain and forage quality can reduce the ability of pasture and rangeland to support grazing livestock. Many weeds, pests, and fungi thrive under warmer temperatures, wetter climates, and increased CO2 levels. Currently, U.S. farmers spend more than $11 billion per year to fight weeds, which compete with crops for light, water, and nutrients. The ranges and distribution of weeds and pests are likely to increase with climate change. This could cause new problems for farmers’ crops previously unexposed to these species. I said ALL OF THE ABOVE! Now I’m done with you here! A dishonest answer really does not suffice! It fits well with normal obfuscation practice from denialists. You really are on your last legs! If one looks through the history of your commentary, for years (yes, years) it has entirely consisted of picking fights with “denialists.” That is the definition of dogmatic thinking, and scientism rather than clear-headed application of the scientific method. Not saying you’re wrong about everything, but it doesn’t help when so many global warming “crusaders” like you so clearly are in it for the egoic boost one gets from claims to “mystical,” hidden knowledge that you can bark at all the “unenlightened” stupid people. I’ve no history of picking fights with peope who are able to interpret science. Of course I picked on denilaist arguments, and they tend to repeat the same arguments ad nauseam. My ego is not a consideration, my despair at the stupididty of humanity is my motivation. Yes Ia have looked carefully at the data for years, far longer than you know. Here we are, 2018, Heat records around the world are being broken at an ever increasing rate. Even last week in the UK. So why did I do it? “Bad men need nothing more to compass their ends, than that good men should look on and do nothing.” John Stuart Mill. ‘They’, who is ‘they’? Did ‘They’ have a previous prediction, or are these ‘They’ a different ‘They’ from the last ‘They’ you waffled on about. We are not talking about one person or even one group of people are we. We are not talking about researchers either in your case, are we? You are an expert at conflating any old rubbish in order to try score a point in your game of babble solitaire. Now try impress. Talk specific. Name names. Here ya go! But is this really necessary? “Scientists in the US have presented one of the most dramatic forecasts yet for the disappearance of Arctic sea ice. “The entire North polar ice cap may well be completely gone in 5 years. How can we comprehend the world in 3 billion years the period of time during which it has existed to 5 years the period of time during which it is expected to now disappear?” – Al Gore, Youtube video. “It seems unthinkable, but for the first time in human history, ice is on course to disappear entirely from the North Pole this year. Wow almost another record low and there were no tidal waves from the melting and New York City is still above water – where’s Al Gore? Is this the inconvenient truth that Al was talking about? Looks like we’ve survived another, Al (Minister of Global Warming Alarmism) Gore’s Climageddon another year… and 40 to 50 more after that! Sounds like Climatology has become more an artful career move than a serious scientific inquiry.